This is a great trail for people who want to wheel or stroll through the woods and enjoy the sound of the stream and forest from one of several benches and decks overlooking the river. Part of the trail is situated between Sucker Creek and the campground, which makes it possible to follow the trail one direction and return to your car on the paved campground road. The other part of the trail crosses over a foot bridge and follows the stream for about a quarter of a mile above Grayback Campground. The trail has a gravel surface and may be challenging for wheelchairs not designed for this type of surface. Grayback Campground is located on the Oregon Caves Highway (Highway 46) about eleven miles from Cave Junction and nine miles from Oregon Caves National Monument. To find the trail, turn into the campground from Highway 46 and drive straight ahead for about 200 feet to where the road ends at an intersection. Turn left and look for the day-use shelter on the right. You will see the foot bridge over Sucker Creek behind the shelter. Grayback Campground with shelter (pavilion) and bridge over Sucker Creek seen near the bottom. 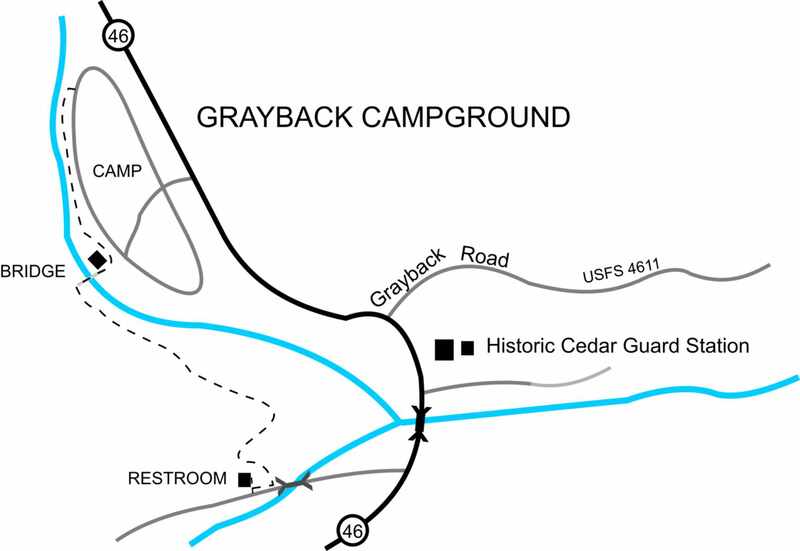 Grayback Campground usually opens in mid May and closes in late September. 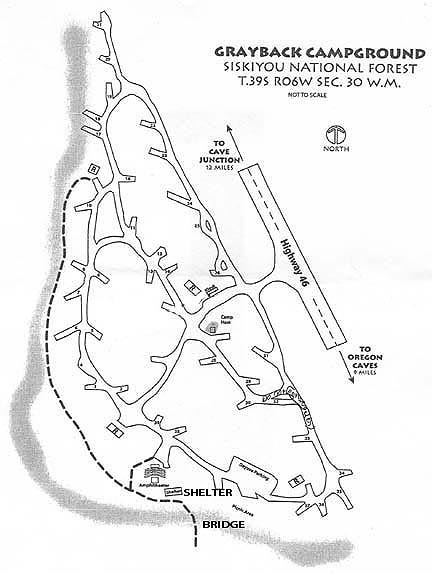 In the illustration, the wheelchair accessible trail is indicated by a dashed line along the left side to the campground next to the river. Public parking is at the pavilion next to the bridge in the lower middle of the picture. A public restroom is seen above and to the left of the pavilion. Sucker Creek has a special significance in Oregon history because this was one of the locations where gold discoveries set-off the Oregon gold rush of 1851. A short summary of the almost simultaneous discovery of gold in Illinois Valley by two separate groups can be found in Oregon’s First Gold Discovery. Sucker Creek was also the site of an unusual publicity stunt in 1914 that was declared to be an experiment of “man against nature”. The stunt involved a man who walked completely naked into the woods with no matches or knife to spend two months with only his wits and bare hands to survive. A short summary of this story can be found at the Siskiyou Nature Man. The campground was established by Civilian Conservation Corps (CCC) crews living at Camp Oregon Caves, located about a quarter mile from the entrance to the campground. The crews lived and worked here during the winter and at Crater Lake National Park during the summer. A short history about this Depression era story can be found at Camp Oregon Caves. Additional information on the loop trail near the site of the historic Camp Oregon Caves can be found at the Cedar Guard Station Loop Trail.